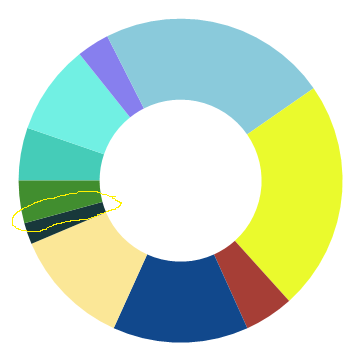 How to remove edge forms completely from a pie chart? If one looks closely at the chart, one can find the white edges (one such sample is outlined in the chart). I want a smooth pie chart without any such edge. The annulus pieces probably partition the complete one as good as exactly, but maybe the rendering rounds off badly. From the output of head @@ ini, you can see that the style of each piece is a Directive with the form Directive[col, EdgeForm[None]]. Not the answer you're looking for? Browse other questions tagged charts or ask your own question. How to create a bar chart from a list of heights *and* bin delimiter positions? How do I animate a bar chart? How to change the Bar chart in contour plot? How to add error bars to a stacked bar chart?